The past week has been particularly good! Of course we had the excitement of a new Royal baby last Monday – congratulations Kate and Will, baby Prince George is a cutie! In other news, I’m now 20 weeks pregnant, so officially half way to meeting our newest little one. We’re so excited. Found his/her heartbeat on our Doppler on Friday night, such a strange but beautiful sound. Am feeling bigger than I thought I’d be at this stage. 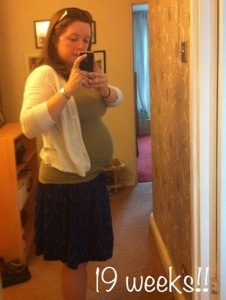 I can’t really remember what I was like at this stage with Elliot but I do feel like a whale already. It was good timing therefore that I won a giveaway on the lovely Honest Mummy‘s blog for £100 of maternity clothes from Seraphine. For someone who never wins anything, I am so very excited!! Luckily the order arrived in double-quick time and is sitting at the end of my desk at work waiting for me to get home and try them all on. I ordered the following things, here’s hoping they all fit! I looked at this crochet trim tunic dress when I was pregnant with Elliot and coveted it from afar. Am really excited to see how it looks on. This waterfall blue cardigan is going to be such an investment piece I can already tell. From covering up expanding waistlines, to breastfeeding and beyond, I think it’s going to become one of those cardigans I can’t live without! Lastly, I thought I’d splash out on a top that will make me feel less like a whale and more special. I think it’s good to have a few things in your maternity wardrobe that don’t feel like maternity clothes. We’re going to a wedding soon so I’m hoping this silk printed tunic, teamed with some sparkly heels will make me feel a little less frumpy. Oh, and did I mention that it’s my birthday next weekend? So far the second trimester is going well! This entry was posted in Cooking, Home, Pregnancy and tagged cooking, Pregnancy, winning competitions. Bookmark the permalink.